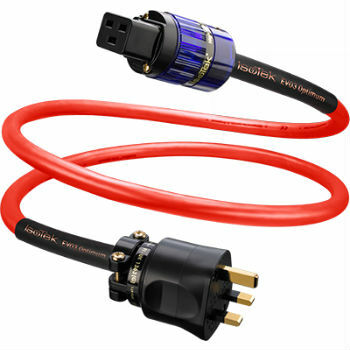 The Optimum is the fourth of IsoTek’s high-performance power cables to be upgraded to the new advanced EVO3 (Evolution 3) version, and is clearly positioned at the top of the range. The new EVO3 Optimum delivers radical advances over its predecessor, the earlier GII version. Cutting-edge thinking in terms of conductor geometries has been combined with excellent materials to develop a cable of superlative quality. At the Optimum’s core are three silver plated copper conductors made from Ohno Continuous Cast (OCC) copper. The OCC process for refining copper, developed and patented by Professor Ohno of Japan’s Chiba Institute of Technology, gives a vastly superior level of purity compared with traditional OFC copper. The benefits for audio and AV applications include outstanding electrical conductivity along with improved flexibility and resistance to fatigue and corrosion. Each of the three 3.0sqmm conductors features a new and innovative square-shaped configuration of 40 strands, each strand also being of square cross-section. This unique design provides an enlarged inter-strand contact surface, further enhancing electrical conductivity. A high quality Teflon FEP dielectric (insulation) is extruded over each conductor, providing a very low dielectric constant over a wide frequency range. The three conductors are given a slight rotational twist to aid RFI and EMI rejection, and are then surrounded by a cotton filler which, as well is adding internal strength and reducing microphony, also possesses superb dielectric properties – similar to FEP. The whole construction is then double shielded by first enclosing it in a Mylar wrap to provide an additional dielectric buffer, before applying an active OFC copper shield for maximum rejection of high frequency interference. A durable, heat-resistant PVC outer jacket gives a high degree of flexibility and mechanical strength.